We got back form Colorado late Sunday night and then spent yesterday celebrating Gina's birthday. It was a great week and, so far, a great vacation. Some hiking, some whitewater rafting, some hot springs soaking. The rest of this week is going to be spent doing some things around the house and sprinkling in some fun things too. May be running up to one of the Oklahoma casinos later in the week. Always fun if not always profitable. Now for something else. This is going to sound incredibly vain, but I sometimes Google my name and the title of my book. I do it to see if anyone has mentioned me. I never find anything I didn't already know about until today. There's a review at the Vintage Crime Blog. You can read it by clicking here. Also, I guest posted yesterday at Kindle Obsessed. You can read it here. I talk about the importance of supporting authors you like. And I wish Gina a happy birthday. Just a note to say that there won't be a Friday Flash post this week. I had enough in the tank to get through seven or eight weeks. This one was going to have to be new, and, since I'm on vacation I didn't get a chance to write a new episode today. I did, however, get to see the town of Creede. It's a cool little mining town up in the mountains of southeastern Colorado. We stopped at the continental divide and took a few pictures. Gina grabbed a handful of snow at the end of June. We visited some shops, bought some fudge and some jewelry. That's a word that I really want to spell "jewelery." Have to look that one up every time I spell it. At the end of the day we went to some hot springs for a soak. Here's what I learned. Water at 91 degrees, not hot enough. Water at 111 degrees, much too hot. Water at 105 degrees, just right. Anyway, like I said, no new Friday Flash this week. Still on vacation and not wanting to spend too much time writing. However, I'm trying to be better about posting regularly, so here's something. Smashwords just got a sales figure update from Sony. Apparently, my freebie story, Consider Us Even, is pretty popular over there. I've had just over 300 downloads there since November. That means that, overall, that book's been downloaded more than 1,000 times. It's astonishing to know that there are 1,000 people out there who have thought my book looked interesting enough to put on their e-reader. Seriously, astonishing. I've also had a few sales at Sony and a few at Apple. Nothing great, but sales I wouldn't have had if Smashwords wasn't able to get me in front of those readers. I mean, 1,000 downloads. Astonishing. We are in Colorado for the first week of our vacation. Look at that. Blogging from vacation. That's how dedicated I am to this blog. It was our first full day here, and we didn't waste any time. We hiked. We saw waterfalls. Well, waterfall. But it was awesome. In the interest of not spending my entire first night of vacation writing this for you all, here are a few pics of Day One. I love you, Gina. Tons and tons. The last of the other things. We are still quite a few books short of our sales goal for the month of June. We've had a few more since I did a little begging last week, and I am truly grateful for those sales. But we are running short on time here. If we don't make it, we don't make it. Still, I'd like to give it a shot. So, I'm asking again for your help. If you've thought about buying a copy of Chasing Filthy Lucre, grab a copy. If you've read it and you know someone who may be interested in the book, let them know. If you read it and liked it and thought you should post a review, go for it. And to help you out, here are the links to all the major sites where you can grab a copy. And like last time, let me know if you do something to help us reach our sales goal. I want to be able to thank you publicly in the comments section. We are up to Part 7 in our Friday Flash adventure. If you've missed any or all of the previous installments click the Friday flash tag at the bottom of this post. Welcome back to Pirate's Bay. We stood in the center of the yard for what felt like days, all of us back to back. We were expecting to have to fight a rush of guards coming to defend their own, but our attack was so fast and so unexpected that instead of charging the other guards just stared at us. These clubs that we'd pulled from the fallen guards were heavy in our hands. They were made of a cold and smooth metal and I had never noticed until I help one that they were more than just something to smack someone with. That's all the guards had ever used them for. One of the prisoners would get mouthy or obstinate and he'd get a thump across the forehead. It'd either lay him out or kill him. The guards never cared which it was. But now that I was holding one I noticed the knobs and buttons near the handle. They were all labeled with some sort of lettering that I didn't understand. It was mostly shapes and dashes. I twisted my hands around the handle and it felt like a baseball bat -- thin and comfortable. I twisted my wrists and the club swung back and forth in front of me. It felt lighter when I did that for some reason. But when I stopped and dropped the club to my side the weight returned. I swung it in small circles by my legs a felt it go light again. I watched the end of the club as I swung it as quickly as I could. That's when I saw the dirt. It was disturbed. A small tornado had built up, spinning clockwise. As I slowed the club the tornado began to fall apart. I spun faster and the little dirt devil grew larger. I am uncomfortable asking folks to buy my book. If you follow me on Twitter (@JarrettRush) you may find that hard to believe, but it's true. Every time I post something there that's "buy my book" related, my finger hovers over the tweet button for just a second before I pull the trigger. My concern is that I'll become the guy I hate, the one who says nothing other than "buy my book." I've unfollowed those guys. I know how annoying they can be. I say that so hopefully you'll know how hard it is for me to type the next sentence. Here's why. I have sales goals each month and this month we are short of meeting it. It's a modest goal, honestly, and we aren't that far behind. Actually, if 10 of you would buy a copy then we'd be a little bit ahead of the pace. I'm asking for your help now because Gina and I are going to be out of town the next week and I'm not going to be as visible online as much as I am usually. I'm hoping to have internet access where we are headed to, but there's no guarantee I'll be able to log on. So, I'm turning to you, my Internet friends. If you like me here and/or like me on Twitter or on Facebook, buy a copy of my book. Support me with your 99 cents. Links to several sites where you can buy the book are under the "Where to read me" tab up above. If you don't have an ereader, you can buy Word documents or pdf files from Smashwords.com. And if you do buy a copy, let me know in the comments so I can publicly thank you. Now, to those of you who've already bought my book, thanks. You're not off the hook, however. I need your help,too. I need you to be my voice next week, and all the time really. If you've read my book and enjoyed it, tell others about it. Tweet about it to your followers. Put up a post on your blog. Mention it to a colleague over lunch. Tell a friend. Help me get the word out and help me make my modest sales goal. I don't have anything to offer than my gratitude, but I would truly appreciate the support. I've always doodled. It's a distraction. Plus, I'm a fidget and need to keep my hands moving, otherwise I'm tapping my fingers on a desk or the edge of a chair. It wasn't until I met Gina that I learned that the doodling was maybe just a part of how I listened and how I think. Gina's a teacher and she said that some kids can look like they are daydreaming or not paying attention, but, really, they are. Whatever they're doing is just how they think. It's how they concentrate. 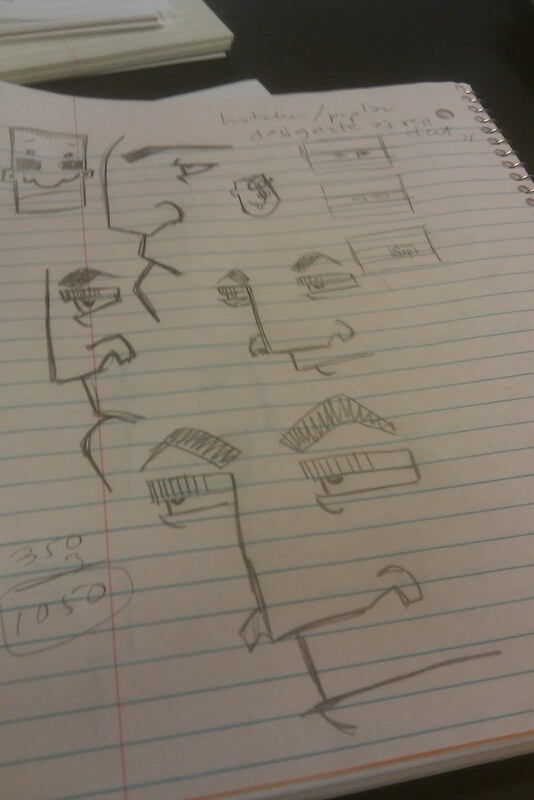 This drawing is me thinking and concentrating during a meeting at work. I haven't talked much about my ebook sales here so far. There are a couple of reasons for that. One is that I don't think it's really anyone's business but mine. There are plenty of writers out there who will do regular updates on sales. That's not me. The second reason is that I don't think it's that interesting for people who aren't writers, and that's who I should be writing this blog for. Ive been reading a bit about platform and establishing my presence online. I love interacting with other writers here and on other social media sites, but the people I should really be trying to reach are readers. And, yes, I know writers are readers. But the majority of the readers I want to reach aren't going to also be writers. One of the things I read repeatedly is that everything we do online should be about establishing your presence and letting people get to know you. Not just you as a writer, but you as a person. I mentioned on Friday that there would be some changes to the blog, and that's what's changing. Future posts won't be solely about writing and books. I am going to open the door a little bit on my personal life. There will still be plenty of posts on writing and books and publishing, but there will also be more. Hope you like it. Before we get to Part 6 of the Friday Flash story, just a couple of words to say that I've been thinking about making some changes to this blog. To say I'm not happy with how often I update it would be an understatement. I've been reading a lot of other writers' blogs. I've found approaches I liked and approaches I didn't like. It's all helped me to develop a plan for how to move forward with this. blog. Yea, if you've been around here for awhile then you've heard me say this before. This time I mean it. My plan is something that I think I can maintain. One of the features that's not going to go away is this Friday Flash serial story. Here's this week's installment. Hope you're enjoying the story so far. And yes, they are all linked. If this is the first one of these you're reading then click the Friday Flash tag at the bottom and read the rest. Get yourself caught up. They never saw it, our bums' rush. Ivanov was in from the beginning. We also recruited Abbey and Jefferson, although they both backed out before we actually did anything. It was a simple plan. Daily during lunch a group of four guards would gather in the middle of the yard and divide up the meager amount of food we were fed. They would then pass out the rations to each man. During their gathering is when we'd attack. The four of us and Mason would walk in a line toward the guards with Ivanov following a distance behind. As we got closer Ivanov would start running and when he let out his rebel yell our line would break and he'd come charging through. And that's what happened. Ivanov broke the line with his head down and his arms spread wide. He hit the first two guards like a linebacker and dragged them both to the ground. He put his boot in the face of one of them, pinning him to the ground. He wrapped the other's neck up in his massive right arm and gave it a violent twist. The guard dropped to the ground in a heap and Ivanov made short work of his second man. While Ivanov worked over his two guards, Tucker and I got the third. Carlson and Wicker handled the fourth. Tucker went high and I went low, wrapping up our man's legs. Tucker smashed him across the face with a rock and a long line of blood shot from his mouth, landing in the dirt next to me. Wicker and Carlson took a bit longer with their guard, but in their defense he was the largest. They each buried a shoulder under their guard's ribs. He took about four steps back and then planted his heels and grabbed the back of each man's uniform. As he lifted each man from the ground a small Englishman named Mason came in from behind and took out the guard's legs. He made some sort of screaming sound and fell to the ground with a crunch. Ivanov put his heel in the guard's jaw, driving his lower teeth past his nose. Ivanov and Tucker each grabbed a weapon from inside a guard's jacket. Carlson handed me and Wicker a weapon and pulled one for himself. We all stood back to back to back to back in the center of the yard. Mason stood in the middle of all of us.
" ... writing takes more than wanting to be a writer. Writing isn’t about making money or reading writing blogs or seeing your name in print. Those things will come, but they’re side effects. This is from a post by Chuck Wendig. Go read it. Find out if you should give up on your writing dream. But take a case of Irish Spring with you so you can wash out your eyes. Chuck likes to work blue. Part 5 of our flash fiction series. If you like it, let me know. If you don't, let me know that, too. We sat in silence for more than a month. I was chained to Wicker who was chained to Carlson who was chained to Tucker. None of us knew why we'd been strung together like this, but it wasn't the first time it'd happened. It was, however, the longest we'd been kept this way. We were attached right arm to left in a long line that wrapped around on itself at least three times..
An overgrown Russian named Ivanov had been making tick marks on a wooden slat that held up the wire fence. He'd gotten to 35 when the guards came around, muttered in their gibberish that they speak to each other, and unlocked all of our cuffs. Ivanov rubbed his wrists and grumbled something none of the four of us could understand. The guards herded us all to the middle of the yard and we stood there for a few moments not understanding what was happening. The largest guard, the one with the tattooed designs up and down each arm and who we all assumed was the leader, came out of his room in the high tower and said something with a voice that sounded more than angry. He then turned to his guards and said something that caused them to back away from all of us by a few steps. The leader then pulled something from his pockets. Small round balls that he tossed high in the air. We all followed their flight from his tower and into our cluster of men. The balls landed on the ground,made a screaming noise, and then exploded. We were all blown back and seven men never got up to dust themselves off. It's been four days since, we know because of the ticks Ivanov has made on his wooden slat. The bodies are still lying in the middle of the yard. Whenever some of us try to move them to the perimeter the guards rush us screaming in their pig Latin and we all move away. It's been four days and the bodies haven't moved. It wouldn't have bothered us before. Something this time tells me that we will move those bodies, because now, four days later, things are different. For all of us.